Building works have recommenced on site. 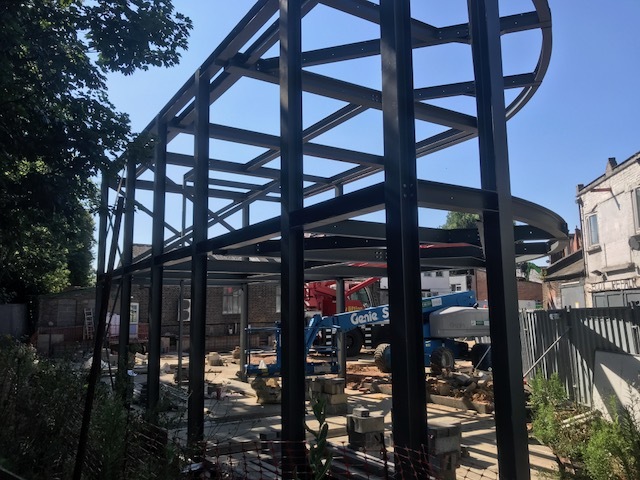 You may have noticed that the steel frame has now been erected on site. The works were completed over a two-week period at the end of June and beginning of July. Our Bespoke bricks have also arrived on site from Belgium and the brick contractors have now made a start constructing the external walls. We hope this phase will take 10 weeks. First floor and roof construction are expected to begin in the next couple of weeks, so progress and the number of workers will pick up on site. By the end of November, the whole external building will be complete along with the flat roof. Following a month of finishes and external landscaping we hope to have The Mews open in the New Year. Our thanks for all the support to date and our apologies for the lack of updates over the last couple of months. We very much look forward to being of service in the not too distant future!